Girls’ Media is a 10-week girls empowerment enrichment program for middle school girls. 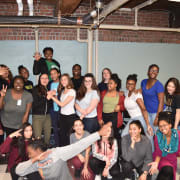 Our goal is to uplift the voices of middle school girls and high school peer leaders, by providing space for conversation, creative expression, and community building. We explore topics such as racial identity, healthy relationships, gender stereotypes, race/racism, media representations, and more. Tutoring Plus is currently accepting volunteer applications for our spring 2018 program! Volunteers should be passionate about youth work and/or girls’ issues. No experience is necessary, as training will be provided. We are looking for applicants with personal experience discussing race, gender, class, healthy relationships, media literacy, and/or identity. The volunteer role involves building relationships with students, helping Peer Leaders with planning, and participating in program activities/discussions. We Accept Volunteers up until the first week of April so it isn't to late to Join! Once you have submitted your application, we will reach out to schedule an interview. For more information or questions, please contact Justien. Tutoring Plus is committed to recruiting volunteers who reflect the diversity of the communities we serve. People of color, bilingual applicants, LGBQ/T identified people, and differently abled people are encouraged to apply. Volunteers will receive training in youth work and program topics, in addition to ongoing support from Tutoring Plus staff. Tutoring Plus does not discriminate on the basis of race, ethnicity, national origin, gender identity, sexual orientation, religion, age, disability, military veteran status or any other characteristic protected by local, state or federal law. Tutoring Plus is dedicated to helping to close the opportunity gap within our neighborhood.